As recently announced by well a known IT giant Microsoft, its Windows Azure Cloud Platform will be launched into production state on January 1 2010. Currently the platform is in its technical preview state, which in a way means that it is not widely available to anyone who wants to “taste” it. So what is this Cloud Platform? To answer this question we need to answer a question of what a cloud computing is first. 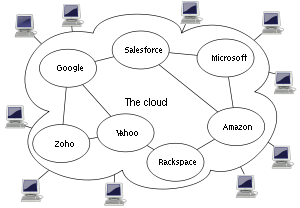 As explained by Wikipedia: “Cloud computing is Internet- (“cloud-“) based development and use of computer technology”. Simply speaking, this is an internet based environment aimed at providing software in a form of a ready to use service, with no need to worry about technical specification of the hardware required, installation and configuration procedures and maintenance. All this is being carried out on the side of the Host, on a so-called “Cloud Platform”. Here term “cloud” refers to the Internet as we know it. The first thing I think of, when trying to imagine a cloud platform I’m familiar with, is Google, as Gmail is a real and efficient application of cloud computing. So why cloud, if it appears to be no different from any other e-mail service we got used to? Well, because it is based on hundreds of computers, making it possible for millions of users to use its services. No matter which Google server is serving you at this given point of time exactly, you still get the very same content as you would from any other Google server. Basically, this is the main concept of the term “cloud”. You have lots of computers linked together and configured to act as an integer entity to provide you with certain services. As of 2009, Microsoft’s share in the market is 88,7%, including the handheld devices. 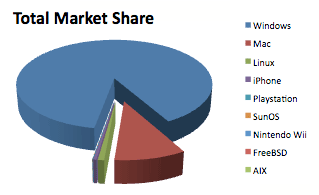 As you can see from the given pie diagram (taken from here) Microsoft occupies the largest part of the computer users in the world. This is particularly why a cloud platform capable of providing a solid foundation for the Windows related technologies such .NET Framework, SQL Server and more is quite important. Microsoft’s Windows Azure platform is a group of cloud technologies that together provide an impressive set of tools for application developers. What is interesting about Azure, is that it isn’t initially aimed at users like me and you, who would simply want to use it as Facebook for example. It is rather a huge tool for developers to create something like Facebook for us to use. The developers in turn will make use of the technologies implemented in the platform, which are widely used today. This means, that the developers will not have to learn new platform, as it already provides everything they use every day to create applications. The Platform itself can be visualized as presented in the following figure. It is a combination of the Windows Azure, SQL Azure and .NET services. As shown by the figure, Azure in general can be used by both applications, run in the cloud and the ones run outside of it (for example by your MS Office from your PC). 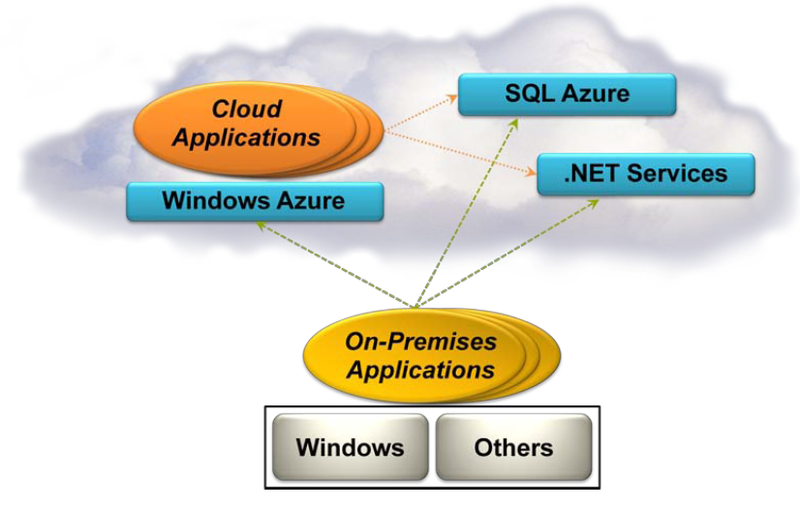 Windows Azure provides the Windows based environment to run applications and store data in the Microsoft datacenters. Basically, Windows Azure is the computational and storage facilities of the whole platform. SQL Azure provides information sharing services in the cloud; it is based on the SQL server. This is in a way a cloud wide database server. .Net provides distributed infrastructure services to cloud-based and local applications. As it has already been mentioned, the Azure Platform will be run from Microsoft Datacenters. Microsoft has invested huge amount of money into building their own datacenters all over the world in order to provide the customers with the hardware base for their Azure platform. However, Azure will not be available for installation in any non-Microsoft datacenter. For those of us who want to run Microsoft technologies on our own servers, IT giant will keep offering products like Windows Server, SQL Server and Exchange Server. Azure Cloud Platform will only be available from the Microsoft datacenters. This means that Azure services will be sold to developers, so that they can build new software in a familiar environment, backed up by solid performance and reliability. After the software is built, it will be offered to users as a service (so called SaaS). Currently Microsoft is planning to give first month of official production free to anyone willing to try it. However, starting February 2010 Azure will become a fee based product. Currently, the cloud market is mostly dominated by Amazon and Google. The Azure will be a source of new customers for Microsoft in the cloud service sector. On the other side, Microsoft has been dropping its points in popularity and total OS market share to other companies (particularly Apple). It is very likely, that by opening the platform to public use, IT giant is trying to get back the attention of the developers. The more applications and uses there are for the operating system or the platform, the more popular it is within the masses, which, in return results, in a greater demand for the service and sales. But what chances does Azure have to gain popularity among the regular users? Main advantage of Azure is the fact that when using it regular users no longer have to install and run applications from their computers. This drastically eases up the processes of starting to use new software. As the entire Azure Cloud Platform will be run on the servers installed and configured by its developer (i.e. Microsoft), numerous incompatibility and stability issues, which currently bother Windows users, are expected to vanish. This, in a way, will be similar to current situation with Apple, where both hardware and OS are produced by the same company. But in case with cloud based applications users will need their computers only to connect to the cloud via the Internet, the rest of the computing will be done by the Microsoft servers. In such a concept whole array of features such as compatibility, reliability, performance and friendliness is introduced through one single Microsoft Azure platform for Windows users. Now, why should we be interested in this platform and use it? Because it is a more efficient and reliable way to do Windows and Internet related activities. Cloud computing is said to be the future of both the Internet and IT technology. Nowadays, compact devices like Pocket PCs and Netbooks capable of connecting to the Internet via Wi-Fi and 3G are widely available to anyone at affordable prices. Instead of using a home PC or a big laptop users will eventually be able to go with a cheaper smaller netbook and still get all the programs and services they normally use, plus constantly stay online and collaborate with others. More information regarding the Azure platform you can find at the official site. Looking for a hosting platform for your website? Take a look at our cheap Linux vps hosting offers.